Type-Choose Suggested if you would like the server checkout to reflect the suggested tip out amount. Choose Automatic if you would like tips outs to be automatically added to a pool. Job Types-Select the job type(s) that will need this tip out type to show on their checkout report. Staff members of these job types are the ones expected or required to perform this tip out. Category- The percentage selected will apply to either Net Sales, Gross Sales or Total Tips to determine the tip out amount. Report Categories - If Gross Sales has been selected as the Category, specific report categories can be selected. The percentage selected will apply to any report categories that are selected. (For example, selecting 2% of Gross Sales and then specifying the Food Report Category will result in the staff tipping out 2% of Food Sales). Balancing- Select Cash option to balance tips out of the current day’s expected cash. Select Payroll option to pay tips out on payroll. 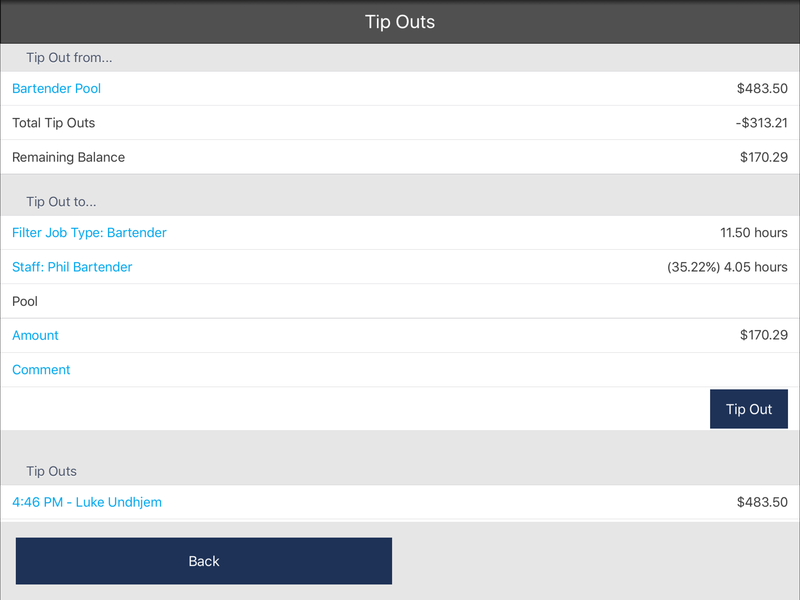 Tip outs and tip pooling can be managed from the Tip Out section on the POS. There are multiple ways to perform a tip out on the POS depending on how the tip out is configured and if the tip out is going to a pool or go directly to an individual. A tip out set as automatic will automatically be allocated to a tip pool and will be available for redistribution on the POS. A tip out that is set as suggested will need to be manually sent to a pool for redistribution or tipped out directly to an individual on the POS. The tip out report allows you to toggle between three views for Pools, Staff and Job Types. The pools view will display all tip out types that have been configured as a pool. The total in column will show the amount that has been added to the pool and the total out column will display the amount that was tipped out of the pool to individual staff. The remaining balance is also shown to indicate any tips that were not distributed. The staff view will display the staff member, total in column, total out column and Net Column. The job type view will display the same data as the staff view except broken down by job type instead of individual staff. There are two permissions options that relate to tips outs. Tip out permissions can be enabled on the Admin website under Location Setup->Permissions. Manage Tip Pools-If enabled, a staff member with this permission will be able to distribute tips from a pool to an individual staff member. Manual Tip Outs- If enabled, a staff member with this permission will be able to manually tip out a custom dollar amount to an individual.